Embroiderers' Association of Canada, Inc.: Giving Youth a Passion to Create for a Lifetime! I must start my blog off with showing you a picture of my round robin sampler which our Guild just completed. We started in January with 5 ladies completing their first row and passing the sampler on to our Chapter President who monitored the rotation. We had each sampler for a 2 month period and then passed it on. Some chose themes and some just let the sampler flow as it may. 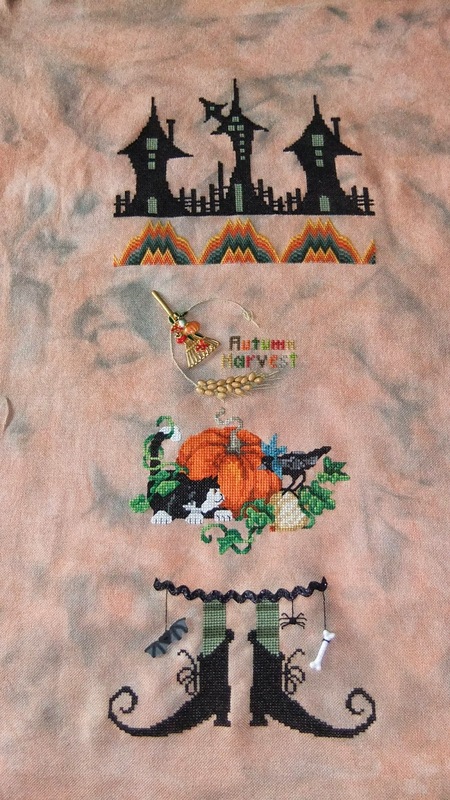 I chose Hallowe’en/Fall and am thrilled with how it came out! We had everyone write down which row they did and if they used a pattern, where that pattern came from and any other pertinent info which I will attach in an envelope to the back of the piece once I have it framed. It was amazing to see all the finished pieces which I may post at a future time. On another theme altogether, I decided last year that it was time to take matters into my own hands when it came to finding someone to take over my ridiculously large stash of stitching supplies down the road. I signed up 4 of my great nieces and 3 other young ladies, daughters of friends as Youth Embroiderers for a year to see if it is a path they may want to follow or at least sample. Today on facebook I saw a picture of one of my great niece’s first stitchery. I am very proud of her first attempt and hope it is only the first of many. I still remember my first stitched piece. It was a needlepoint kit, a gift I received for Christmas when I was 13 years old. I had no idea how to do it, but my mum guided me and I followed the instructions and have never looked back. That piece hung in my parents’ house until mum passed on and I now have it back. Writing this blog made me think of it so I dug it out of the closet. 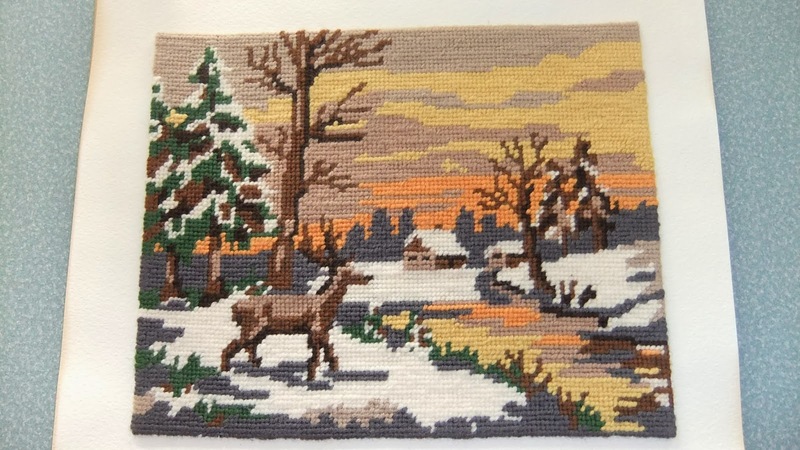 I have included a picture of it here, the needlepoint deer. As I looked at it I realized I likely did not follow any of the proper protocol for mounting and framing such a piece as there was no matting so the stitching rested right against the glass, but it seems not to be too much the worse for wear. I think sometimes we get very worked up about preserving our pieces for posterity and although I am very proud of this piece for my first try, it is not likely to pass any further than myself. I will attempt to reframe it though with at least some matting. I am tempted to wash it and stretch it to properly mount it but am kind of afraid of how it would react after 40 years in this position. So many people I talk to about stitching at our displays and shows say they wish they could stitch but think they could never do it. That is why I think it is so important to expose young people to stitching. If they do some of it when they are young they know it is not some mystical, magical thing. Many times over the years life has gotten in the way and I have hung up my needle and thread for a while but I always find my way back. I am a firm believer in getting children to use their creativity as much as possible. I always remember being so excited to receive something to do for special occasions like birthdays, Easter and Christmas. It may have been a colouring book, paint by number, jigsaw puzzles, doodle arts, etc but it was something to sit down and physically do once the excitement of the occasion was over. It was likely just a very smart parenting skill of my mother’s to try to have a moment’s peace while preparing the meal, but I firmly believe it has led me down the path I have taken in life, loving all things creative. I even still have a stack of colouring books in my book case which I use for such things as gallery glass, embroidery and even knotwork pictures like the pumpkin trading card attached. As I have mentioned in a previous blog it is also what led me to start a new project every Christmas. I wrap up all the necessary supplies and give it to myself Christmas day to start something new no matter how many projects I already have on the go or how busy the day is, it is my gift to myself to start out on a new creative adventure. It still gives me that contented feeling I remember from so long ago. So I challenge everyone to foster the creativity in a youth. Spend some time with them doing something creative and fun for their age and attention span level. Show them the possibilities of what they can do with their own little hands. Let’s overwhelm the Youth Director with potential new stitching Picassos (sorry Linda…lol). What a wonderful and fun round robin piece! 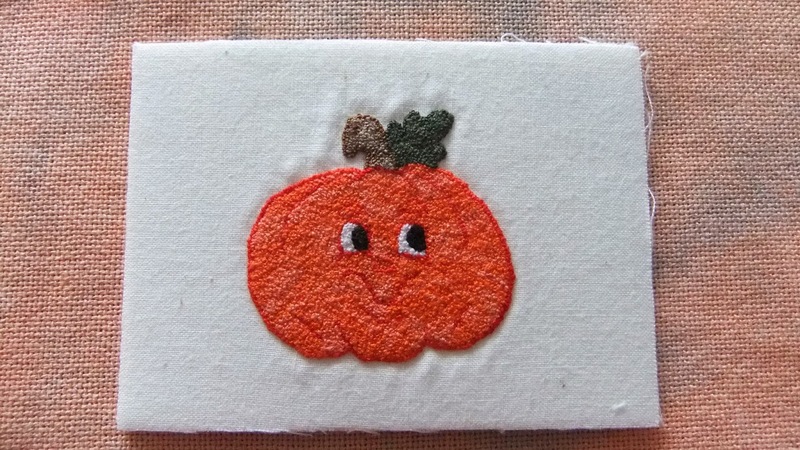 Hallowe'en is my favourite holiday other than Christmas and this Hallowe'en stitching is so creative and such fun! I love that you have your first piece of stitching still too -these pieces are very special as they have started a journey that lasts a lifetime. I am going to try to figure out a way to meet your challenge of involving more youth in stitching - will let you know how I get on!